Mentax® Cream, 1%, contains the synthetic antifungal agent, butenafine hydrochloride. Butenafine is a member of the class of antifungal compounds known as benzylamines which are structurally related to the allylamines. Butenafine HCl is a white, odorless, crystalline powder. It is freely soluble in methanol, ethanol, and chloroform, and slightly soluble in water. Each gram of Mentax® Cream, 1%, contains 10 mg of butenafine HCl in a white cream base of purified water USP, propylene glycol dicaprylate, glycerin USP, cetyl alcohol NF, glyceryl monostearate SE, white petrolatum USP, stearic acid NF, polyoxyethylene (23) cetyl ether, benzyl alcohol NF, diethanolamine NF, and sodium benzoate NF. In one study conducted in healthy subjects for 14 days, 6 grams of Mentax® Cream, 1%, was applied once daily to the dorsal skin (3,000 cm2) of 7 subjects, and 20 grams of the cream was applied once daily to the arms, trunk and groin areas (10,000 cm2) of another 12 subjects. After 14 days of topical applications, the 6-gram dose group yielded a mean peak plasma butenafine HCl concentration, Cmax of 1.4 ± 0.8 ng/mL, occurring at a mean time to the peak plasma concentration, Tmax, of 15 ± 8 hours, and a mean area under the plasma concentration-time curve, AUC0-24 hrs of 23.9 ± 11.3 ng-hr/mL. For the 20-gram dose group, the mean Cmax was 5.0 ± 2.0 ng/mL, occurring at a mean Tmax of 6 ± 6 hours, and the mean AUC0-24 hrs was 87.8 ± 45.3 ng-hr/mL. A biphasic decline of plasma butenafine HCl concentrations was observed with the half-lives estimated to be 35 hours and > 150 hours, respectively. At 72 hours after the last dose application, the mean plasma concentrations decreased to 0.3 ± 0.2 ng/mL for the 6-gram dose group and 1.1 ± 0.9 ng/mL for the 20-gram dose group. Low levels of butenafine HCl remained in the plasma 7 days after the last dose application (mean: 0.1 ± 0.2 ng/mL for the 6-gram dose group, and 0.7 ± 0.5 ng/mL for the 20-gram dose group). The total amount (or % dose) of butenafine HCl absorbed through the skin into the systemic circulation has not been quantitated. It was determined that the primary metabolite in urine was formed through hydroxylation at the terminal t-butyl side-chain. In 11 patients with tinea pedis, butenafine HCl cream, 1%, was applied by the patients to cover the affected and immediately surrounding skin area once daily for 4 weeks, and a single blood sample was collected between 10 and 20 hours following dosing at 1, 2 and 4 weeks after treatment. The plasma butenafine HCl concentration ranged from undetectable to 0.3 ng/mL. In 24 patients with tinea cruris, butenafine HCl cream, 1%, was applied by the patients to cover the affected and immediately surrounding skin area once daily for 2 weeks (mean average daily dose: 1.3 ± 0.2 g). A single blood sample was collected between 0.5 and 65 hours after the last dose, and the plasma butenafine HCl concentration ranged from undetectable to 2.52 ng/mL (mean ± SD: 0.91 ± 0.15 ng/mL). Four weeks after cessation of treatment, the plasma butenafine HCl concentration ranged from undetectable to 0.28 ng/mL. Butenafine HCl is a benzylamine derivative with a mode of action similar to that of the allylamine class of antifungal drugs. Butenafine HCl is hypothesized to act by inhibiting the epoxidation of squalene, thus blocking the biosynthesis of ergosterol, an essential component of fungal cell membranes. The benzylamine derivatives, like the allylamines, act at an earlier step in the ergosterol biosynthesis pathway than the azole class of antifungal drugs. Depending on the concentration of the drug and the fungal species tested, butenafine HCl may be fungicidal or fungistatic in vitro. However, the clinical significance of these in vitro data are unknown. In the following data presentations, patients with tinea (pityriasis) versicolor were studied. The term “Negative Mycology” is defined as absence of hyphae in a KOH preparation of skin scrapings, i.e., no fungal forms seen or the presence of yeast cells (blastospores) only. The term “Effective Treatment” is defined as Negative Mycology plus total signs and symptoms score (on a scale from zero to three) for erythema, scaling, and pruritus equal to or less than 1 at Week 8. The term “Complete Cure” refers to patients who had Negative Mycology plus sign/symptoms score of zero for erythema, scaling, and pruritus. Two separate studies compared Mentax® Cream to vehicle applied once daily for 2 weeks in the treatment of tinea (pityriasis) versicolor. Patients were treated for 2 weeks and were evaluated at the following weeks post-treatment: 2 (Week 4) and 6 (Week 8). All subjects with a positive baseline KOH and who were dispensed medications were included in the “intent-to-treat” analysis shown in the table below. Statistical significance (Mentax® vs. vehicle) was achieved for Effective Treatment, but not Complete Cure at 6 weeks post-treatment in Study 31. Marginal statistical significance (p = 0.051) (Mentax® vs. vehicle) was achieved for Effective Treatment, but not Complete Cure at 6 weeks post-treatment in Study 32. Data from these two controlled studies are presented in the table below. Absence of hyphae in a KOH preparation of skin scrapings, i.e., no fungal forms seen or the presence of yeast cells (blastospores) only. Tinea (pityriasis) versicolor is a superficial, chronically recurring infection of the glabrous skin caused by Malassezia furfur (formerly Pityrosporum orbiculare). The commensal organism is part of the normal skin flora. In susceptible individuals, the condition may give rise to hyperpigmented or hypopigmented patches on the trunk which may extend to the neck, arms, and upper thighs. Treatment of the infection may not immediately result in restoration of pigment of the affected sites. Normalization of pigment following successful therapy is variable and may take months, depending upon individual skin type and incidental sun exposure. The rate of recurrence of infection is variable. Mentax® (butenafine HCl) Cream, 1%, is contraindicated in individuals who have known or suspected sensitivity to Mentax® Cream, 1%, or any of its components. 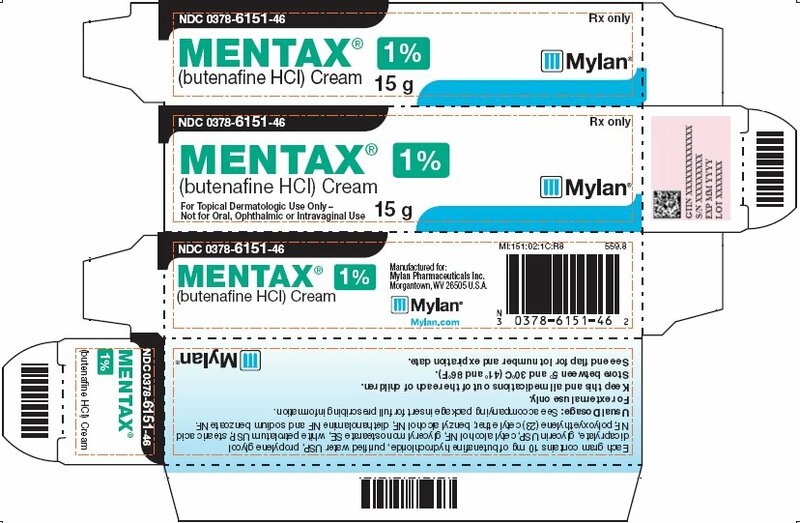 Mentax® (butenafine HCl) Cream, 1%, is not for ophthalmic, oral, or intravaginal use. Mentax® Cream, 1%, is for external use only. If irritation or sensitivity develops with the use of Mentax® Cream, 1%, treatment should be discontinued and appropriate therapy instituted. Diagnosis of the disease should be confirmed either by culture on an appropriate medium, [except M. furfur (formerly P. orbiculare)] or by direct microscopic examination of infected superficial epidermal tissue in a solution of potassium hydroxide. Patients who are known to be sensitive to allylamine antifungals should use Mentax® (butenafine HCl) Cream, 1%, with caution since cross-reactivity may occur. Use Mentax® Cream, 1%, as directed by the physician, and avoid contact with the eyes, nose, mouth, and other mucous membranes. Use Mentax ® Cream, 1%, as directed by the physician. The hands should be washed after applying the medication to the affected area(s). Avoid contact with the eyes, nose, mouth, and other mucous membranes. Mentax ® Cream, 1%, is for external use only. Dry the affected area(s) thoroughly before application, if you wish to apply Mentax ® Cream, 1%, after bathing. Use the medication for the full treatment time recommended by the physician, even though symptoms may have improved. Notify the physician if there is no improvement after the end of the prescribed treatment period, or sooner, if the condition worsens (see below). Inform the physician if the area of application shows signs of increased irritation, redness, itching, burning, blistering, swelling, or oozing. Potential drug interactions between Mentax® (butenafine HCl) Cream, 1%, and other drugs have not been systematically evaluated. Long-term studies to evaluate the carcinogenic potential of Mentax® Cream, 1%, have not been conducted. Two in vitro assays (bacterial reverse mutation test and chromosome aberration test in Chinese hamster lymphocytes) and one in vivo study (rat micronucleus bioassay) revealed no mutagenic or clastogenic potential for butenafine. In subcutaneous fertility studies conducted in rats at dose levels up to 25 mg/kg/day (0.5 times the maximum recommended dose in humans for tinea versicolor based on body surface area comparisons), butenafine did not produce any adverse effects on male or female fertility. Subcutaneous doses of butenafine (dose levels up to 25 mg/kg/day administered during organogenesis) (equivalent to 0.5 times the maximum recommended dose in humans for tinea versicolor based on body surface area comparisons) were not teratogenic in rats. In an oral embryofetal development study in rabbits (dose levels up to 400 mg butenafine HCl/kg/day administered during organogenesis) (equivalent to 16 times the maximum recommended dose in humans for tinea versicolor based on body surface area comparisons), no treatment-related external, visceral, skeletal malformations or variations were observed. In an oral peri- and post-natal developmental study in rats (dose levels up to 125 mg butenafine HCl/kg/day) (equivalent to 2.5 times the maximum recommended dose in humans for tinea versicolor based on body surface area comparisons), no treatment-related effects on postnatal survival, development of the F1 generation or their subsequent maturation and fertility were observed. There are, however, no adequate and well-controlled studies that have been conducted with topically applied butenafine in pregnant women. Because animal reproduction studies are not always predictive of human response, this drug should be used during pregnancy only if clearly needed. It is not known if butenafine HCl is excreted in human milk. Because many drugs are excreted in human milk, caution should be exercised in prescribing Mentax® Cream, 1%, to a nursing woman. Safety and efficacy in pediatric patients below the age of 12 years have not been studied since tinea versicolor is uncommon in patients below the age of 12 years. In controlled clinical trials, 9 (approximately 1%) of 815 patients treated with Mentax® Cream, 1%, reported adverse events related to the skin. These included burning/stinging, itching and worsening of the condition. No patient treated with Mentax® Cream, 1%, discontinued treatment due to an adverse event. In the vehicle-treated patients, 2 of 718 patients discontinued because of treatment site adverse events, one of which was severe burning/stinging and itching at the site of application. In uncontrolled clinical trials, the most frequently reported adverse events in patients treated with Mentax® Cream, 1%, were: contact dermatitis, erythema, irritation, and itching, each occurring in less than 2% of patients. In provocative testing in over 200 subjects, there was no evidence of allergic-contact sensitization for either cream or vehicle base for Mentax® Cream, 1%. Overdosage of butenafine HCl in humans has not been reported to date. Patients with tinea (pityriasis) versicolor should apply Mentax® Cream, 1%, once daily for two weeks. Sufficient Mentax® Cream should be applied to cover affected areas and immediately surrounding skin of patients with tinea versicolor. If a patient shows no clinical improvement after the treatment period, the diagnosis and therapy should be reviewed. STORE BETWEEN 5° and 30°C (41° and 86°F). NF, polyoxyethylene (23) cetyl ether, benzyl alcohol NF, diethanolamine NF and sodium benzoate NF.